Uber did something really simple: it created software that would allow you to hail a cab. But it did this well. As a result, Uber is valued over $60 billion for its taxi hailing service in over 81 countries! And this change that the taxi service brought about has also changed the way e-commerce tackles its last mile. If you read the six bullet points again, you will realize that we might as well have been talking about some other kind of service, and not taxis. And that's where the concept of Uberification started. What's Uberification and Why Is It Such a Rage? As is obvious, this is great for consumers. No wonder then that there is a significant surge in local businesses that are adopting an Uber-like model. What Are the Services That Are Getting Uberized/Uberified? Beauty: Beauty and wellness services can be aggregated in the "at your doorstep format," thereby almost literally using the Uber model. Delivery: This is one of the sectors where densely populated cities around the world have seen a spurt in Uberified startups. Unlike pizza, which has forever been home delivered, now you can get almost anything delivered to you at home. It has been made possible by vehicle fleets that work on fairly scientific routing algorithms. This has made deterministic delivery schedules possible. Food: As recently as a couple of years ago, you had to wonder whether your favorite restaurant delivers food home. Now that is largely a non-issue as someone, or the other will get you food from that restaurant. Health: Be it physiotherapists, masseurs, home-visit doctors, or what have you. Today you can use an Uber-like tool to get a provider to visit you, and take care of your health needs. Home Services: In any major city around the world, getting a plumber, carpenter, handyman, electrician, air conditioner mechanic, or the like has always been a nightmare. 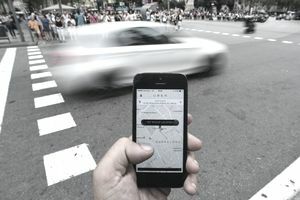 Today there are several Uberized startups that are aggregating service providers as an on-demand mobile service and establishing some service standards. Goods Transportation: If Uber is about transporting people, it was only a matter of time before someone would start an Uber for renting trucks instead of taxis. At the heart of any Uberified service is that fact that technology allows you to track orders, service, location, delivery, ratings, and a whole lot more, by merely using your smartphone. That is the fundamental promise of Uberification. And find that is a sound promise. Despite the froth in the early stage startup ecosystem, I think that this trend is here to stay. And successful e-commerce businesses are happily riding the wave on top of these ODMS providers.